I got my paws on a freshly bolted together HTC Wizard AKA Cingular 8125 today and it leaves little to be desired. The display is nice, and the orientation flips automatically when you slide it open, only after releasing a latch on the lower left side to unlock the screen. This means that you need two hands to open the thing, which begs the question, who thought that was a good idea? Why not use a ball bearing? It's all ball bearings these days! When opening or closing it, you frequently tap the volume knob at the top left corner which brings up the huge volume display over the top whatever it is that you really want to see. The 200MHz processor is a slow dog running Windows Mobile 5.0 and it frequently freezes, or should I say "thinks" when you are trying to use the interface. A stylus is nearly required when closed since using a touch screen to dial a phone is like using a keyboard with mittens, neither of which I recommend. The worst thing about dialing via the screen is that it only auto-completes when you enter numbers from your address book, not a name. Even when the keyboard is open, you have to select a first letter of the alphabet, then use the wheel to scroll down to the entry you want to dial. This better get fixed from a menu option or a flash upgrade... This phone is no Treo, which does a great job finding numbers in the address book just by typing a name on the phone screen. Now why couldn't Microsoft emulate that interface? This one, goes back to where it came from. 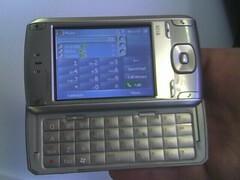 Treo 700p, where art thou?